Welcome to Wine Quiz number Five. Please choose from the list of possible answers to each question. 1: Paarl is a region in which wine producing country? Paarl is one of the traditional wine regions of the Western Cape in South Africa. 2: The famous white wine of Sancerre is made from which grape? White Sancerre is always Sauvignon Blanc. Red and Rose Sancerre is also produced in the region, always made from Pinot Noir. 3: Rivers running from the Andes to the Pacific influence which country’s winemaking? Chile has a long Pacific coast that is influential on winemaking, but so too are the Andes and the rivers that run between them. 4: Which of these grapes has a distinctive pink coloured skin? Gewurztraminer has a blush of pink, sometimes giving a tinge of copper colour to the wines. Cava is Spanish sparkling wine, most coming from Penedes in the north east, but it can be made in various Spanish districts. 6: Geyserville is in which wine producing area? Geyserville is in Sonoma County in California. 7: Traditionally what wine is mixed with cassis to make a Kir? Aligote, a minor grape from Burgundy, is the traditional base for Kir. A Kir Royale is made with Champagne or other sparkling wine. 8: What region of origin has been removed from this german label? 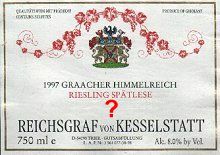 This label gives the specific village and vineyard where this wine comes from (Graacher Himmelreich) which is in the Mosel – Saar – Ruwer. 9: What makes AC Bordeaux Superieur superior? There is not necessarily any difference in quality, the Superieur classification is granted because of that half a degree more alcohol. 10: By law, what percentage of an Alsace Riesling must be Riesling? Alsace is unusual in demanding 100% of the named variety in a bottle – in most regions around the world having 85% or even 75% is enough. Yes, ‘Brut’ is actually drier than ‘Extra Sec’, which means ‘Extra Dry’ in French. 12: Pouilly-Fuisse is an appellation in which French wine region? 13: Gobelet and Guyot are what? These are two of many different vine training systems, but two of the most common around the world. 14: Legally, grapes for ‘English wine’ must come from where? English wine can indeed be made from grapes grown in Wales. But ‘British wine’ can be made from grapes or grape concentrate imported from anywhere. 15: Which wine is named after its Danish maker, Peter Sisseck? Pingus is one of Spain’s most expensive wines, and was Peter Sisseck’s childhood name. 16: Why does a winemaker ‘Cold Stabilise’ his or her white wines? Tartrates can form as small white crystals in wines that have not been stabilised – they are harmless, but can look alarming to the consumer. 17: What is Bordeaux Mixture? This is a traditional mix of copper and sulphur used to protect vines against rot and disease. 18: Albariza soil is important for growing vines for which wine? This is the chalky soil of Jerez in Spain, where the vines for Sherry are grown. 19: This is a snippet of which famous wine producer’s label? 20: Hungarian Tokaji is measured in puttonyos. What is puttonyos? Puttonyos is a sweet grape must, the measurement – a Puttonyos – equating to old wooden hods, or carrier baskets, used to carry the grapes.